Technically speaking, it's a static-site generator slightly focused on building documetation. That's it! Project is ready for building! Thats it! You may edit or create .md files, starting from index.md with your favorite text editor. Docta is a lightweight tool built on top of modern and proven technologies. Our goal is to keep it simple, focused and provide really smooth user experience. 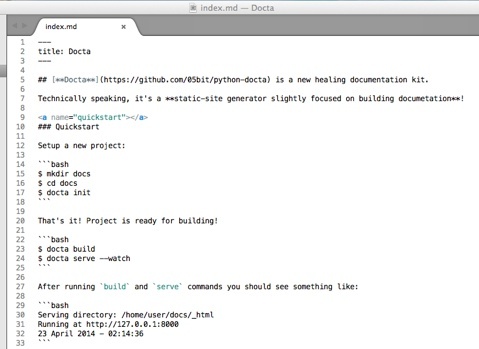 Docta is distributed for free and its source code is licensed under the BSD 3-Clause License.